BANDWIDTH HAWK 6 | B R O A D B A N D C O M M U N I T I E S | w w w. b r o a d b a n d c o m m u n i t i e s . c o m | A U G U S T / S E P T E M B E R 2 0 1 8 I n the four years I have studied rural broadband and economic growth, I have consistently shown that at least a quarter and as much as half of rural population loss is due to lack of broadband access (confidence level 96 percent for a quarter of population loss). is pattern held with almost no change from the last census in 2010 through 2016 (see the box on p. 8 for a list of key articles and findings using data through 2016). Last year, the pattern changed slightly, but the uncertainties – the "fuzziness" – of the data I use to make the calculations increased greatly. Deeply rural counties continued to lose population, although at a slower rate. A quarter to half that loss is still attributable to lack of good broadband access, but the level of certainty is lower – just over 80 percent (four out of five chances) rather than 96 percent (24 out of 25). THE URBAN CORE LOST POPULATION From 2010 to mid-2016, the population of all rural counties (as measured by the census) declined by about 1.25 percent. at's about 500,000 people. It does not sound like a lot in a nation that has a population of more than 325 million, but it is more than enough to reduce property values and rural wealth significantly. Property values declined in rural areas as jobs dried up and people left. Until mid-2016, people, for the most part, moved to urban areas, raising the need for spending on new urban infrastructure and quickly increasing urban property values. 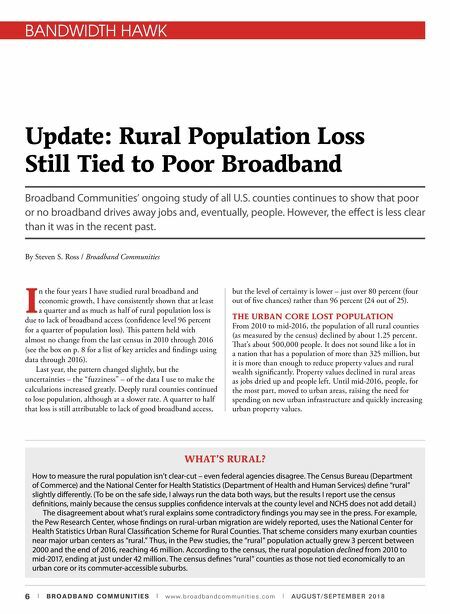 Update: Rural Population Loss Still Tied to Poor Broadband Broadband Communities' ongoing study of all U.S. counties continues to show that poor or no broadband drives away jobs and, eventually, people. However, the effect is less clear than it was in the recent past. By Steven S. Ross / Broadband Communities WHAT'S RURAL? How to measure the rural population isn't clear-cut – even federal agencies disagree. The Census Bureau (Department of Commerce) and the National Center for Health Statistics (Department of Health and Human Services) define "rural" slightly differently. (To be on the safe side, I always run the data both ways, but the results I report use the census definitions, mainly because the census supplies confidence intervals at the county level and NCHS does not add detail.) The disagreement about what's rural explains some contradictory findings you may see in the press. 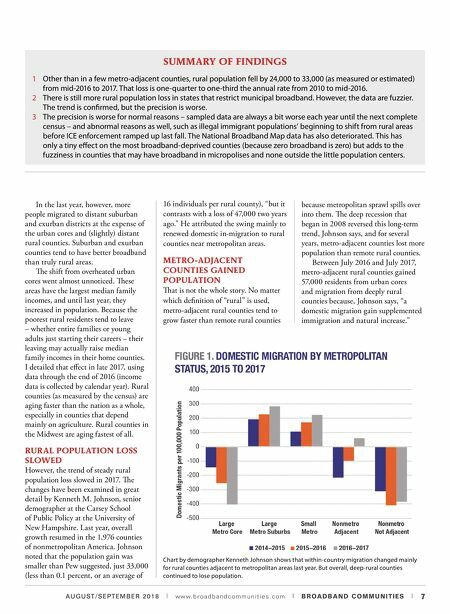 For example, the Pew Research Center, whose findings on rural-urban migration are widely reported, uses the National Center for Health Statistics Urban Rural Classification Scheme for Rural Counties. That scheme considers many exurban counties near major urban centers as "rural." Thus, in the Pew studies, the "rural" population actually grew 3 percent between 2000 and the end of 2016, reaching 46 million. According to the census, the rural population declined from 2010 to mid-2017, ending at just under 42 million. The census defines "rural" counties as those not tied economically to an urban core or its commuter-accessible suburbs.